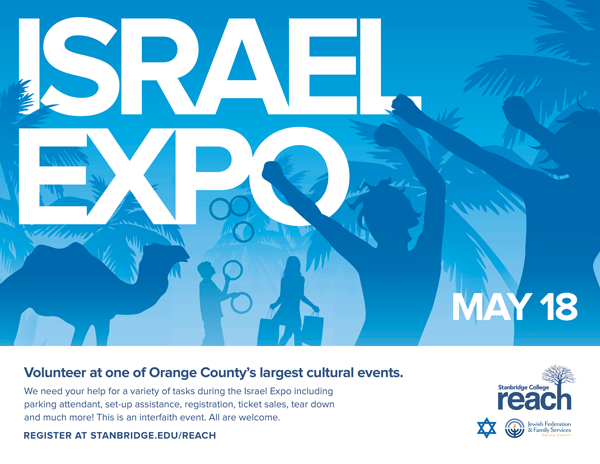 Stanbridge College REACH – Beyond the Classroom™ invites you to volunteer at the Israel Expo OC, a unique community celebration of Israel on Sunday, May 18th in Irvine. Israel Expo is OC’s largest community celebration of Israel, drawing over 10,000 people of all faiths and backgrounds to experience Israeli culture, history and values. Additional information will be distributed to volunteers upon registration. To learn more about the Israel Expo please visit www.israelexpo.org. We hope that you will take advantage of this unique volunteer opportunity and get involved in our community!